Give me an R for Redware! We’re making our way down the alphabet trail and this week the letter R takes its turn. 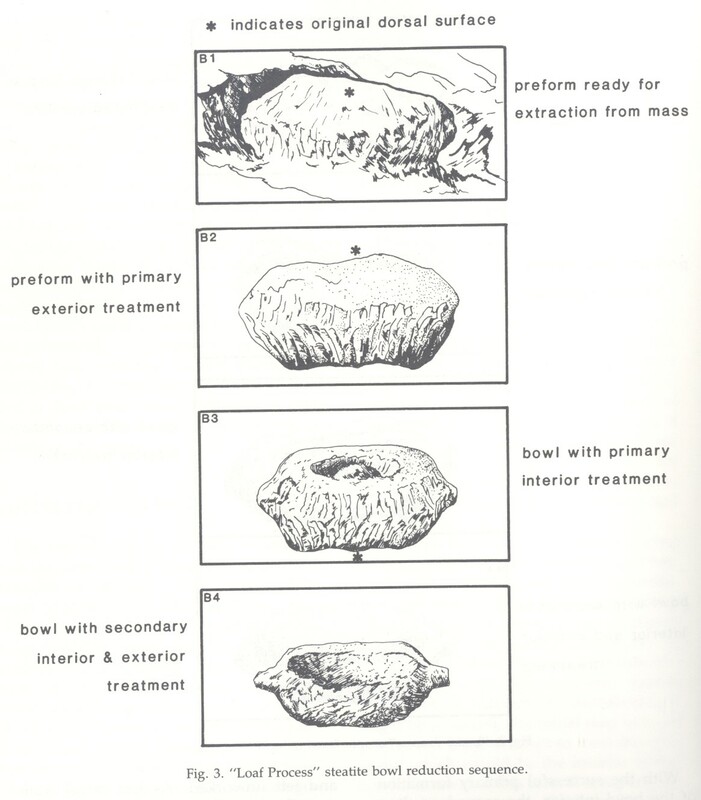 Radiocarbon dating, Raccon notched points, repatriation, Rockingham and Rhenish ceramics all fit the bill, and of course rhyolite came to mind, but our recent blogs on quarries seem to cover this subject, so the spotlight turns to the most humble of historic ceramics this week, redware. Redware is often referred to as red earthenware because of the color of the material from which it is produced, literally red or reddish-orange clay, and is often dug locally by the potter. The vessels made from this clay were fired at a lower temperature, as compared to stoneware, and often painted with a clear lead or brown manganese glaze. Because they were fired at low temperatures and the clay was locally available, they were relatively inexpensive to produce and replace, as they are also easily broken. 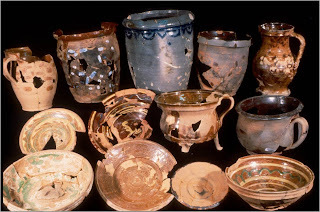 Throughout the early colonies including Pennsylvania, evidence of redware production in America dates to the seventeenth century. Redware was predominately produced by German immigrants settling in the southeastern areas of the state who had a long tradition as potters in Europe. Produced as a utilitarian ware the forms vary widely from table wares like as bowls, cups and plates up to large multi-gallon storage crocks. 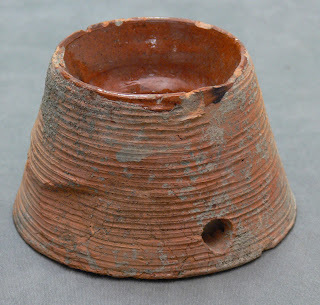 Still more unusual forms such as this roach trap recovered from excavations in Philadelphia were made from this common, locally sourced red clay. 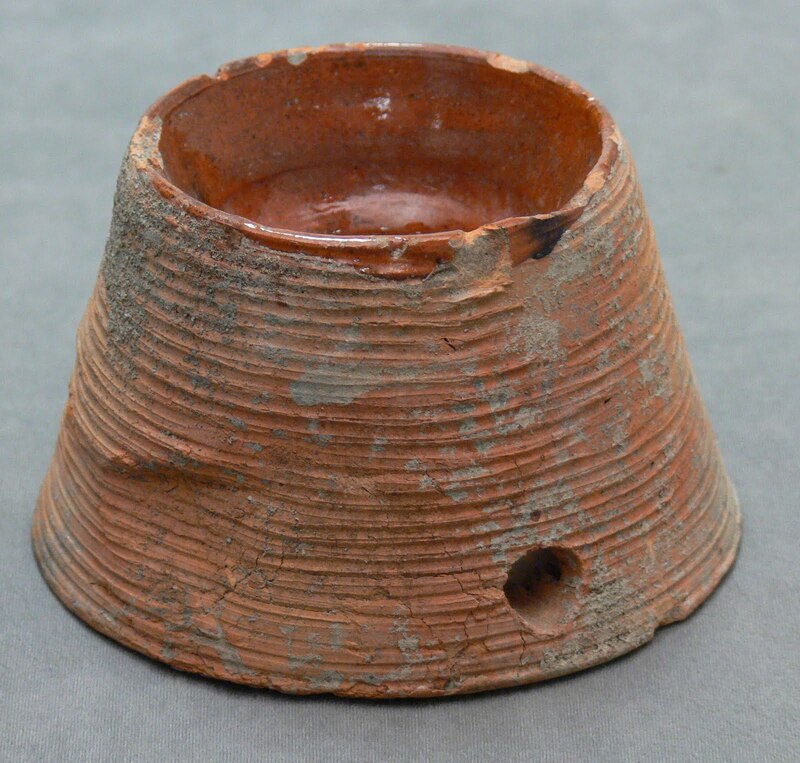 A redware roach trap excavated from Market St., Philadelphia. 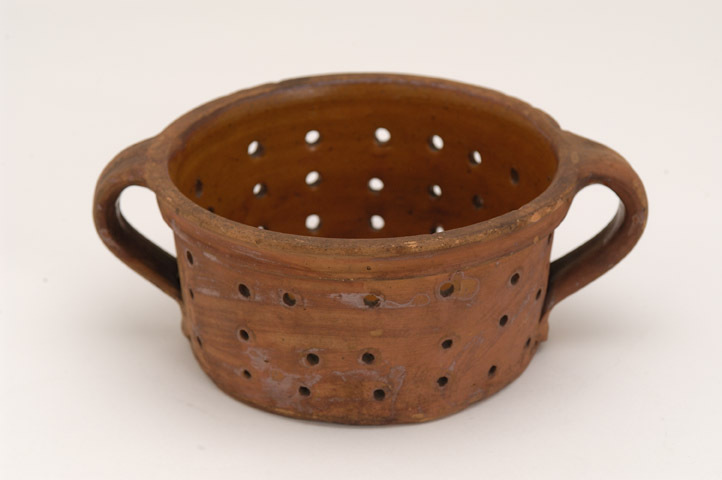 This two handled colander is another example of a red earthenware utility piece. Redware production continues today, and has no end production date. Normally there is a beginning date of production and conversely an end date for the various forms of pottery. Ceramics recovered from archaeological sites are utilized by archaeologists as a tool for dating sites. Because redware does not have this end production date, its use as a dating tool for archaeologists is limited. Ongoing research on the variation in form and decoration has compiled a comparative data set that allows archaeologists to denote subtle patterns in redware production which can aid in relative dating. While not as precise a dating tool as some other ceramic types, some general observations can be made concerning the cultural groups that were producing these utilitarian wares. Researchers believe that the details in this decoration can be attributed to the Moravian Potters from the Bethlehem area who relocated to North Carolina in the 1750s. Reconstructed pottery from Ephrata Cloister exhibit the variety of table wares produced locally by Pennsylvania Germans. Not many words begin with the letter “Q”. Luckily, one word that does, “Quarry”, is very significant in Pennsylvania archaeology. As we all know the use of stone tools was central to many groups of prehistoric humans and it is thus very useful for archaeologists to know where and how these resources were obtained. Like other types of archaeological sites, quarries are integral to the complete picture of how Native Americans lived and worked. They provide crucial details regarding prehistoric technology. 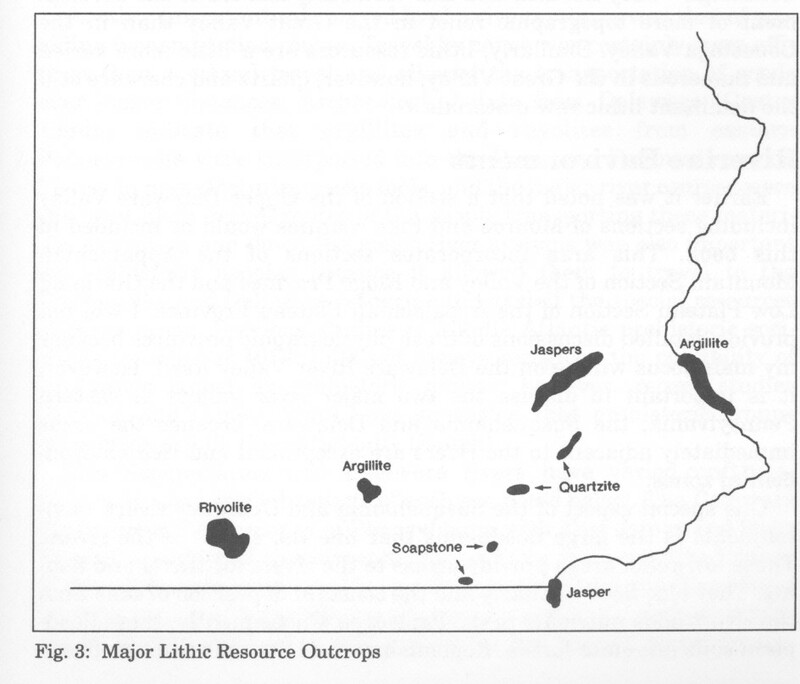 Furthermore, they give us insight into where lithic resources were originally procured. The ability to link stone tools to their provenance adds specificity and credence to our models of the movements of people and goods in prehistoric times. Prehistoric quarry sites are the locations where lithic materials are obtained for use in the manufacture of stone tools (including ground stone artifacts such as steatite vessels, celts, adzes, and grooved axes). Pennsylvania has naturally occurring sources of a variety of lithic materials that were used extensively in prehistoric times, including quartz, quartzite, rhyolite, argillite, chert, jasper, chalcedony, and steatite. Quarries can be located at either primary (original provenance) or secondary (cobble) sources and materials can be naturally exposed or uncovered through excavations. Excavations in Pennsylvania appear to consist of open pits, some of which were quite large. At King’s Quarry in Lehigh County, for example, a prehistoric pit was found to have been dug to 23 feet below the surface. As lithic technologies were prevalent in Pennsylvania from the Paleoindian period until European contact, individual quarries often remained a valuable resource for thousands of years. The reuse of quarries over such long periods of time resulted in large amounts of soil disturbance at many sites. At the Vera Cruz Jasper Quarry in Lehigh County archaeologists discovered that new pits were often dug into previously disturbed soil, and researchers project that every part of the 130m x 400m ridgetop at Vera Cruz was probably excavated at some point in time (Hatch and Miller 1985:222). A more in depth account of the variety found in various Pennsylvania quarries can be found in a previous blog (January 28, 2011) dealing with this subject. Artifacts and features associated with prehistoric human habitation are almost never found at quarry sites; quarries are almost always used exclusively for lithic procurement. 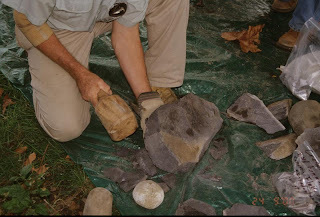 The most common artifacts on chipped stone quarry sites are debitage (debitage is the excess stone removed from a tool as it is being made- the byproduct of flint knapping). Interestingly, archaeological evidence identified by analysis of this debitage demonstrates that Native Americans would test pieces of stone for flaws and impurities and sometimes very roughly start the process of shaping a tool, but rarely would they complete the fine detailed work necessary in finishing a tool at the quarry itself. Discarded materials occur on quarry sites as chunky or blocky pieces of unknappable material sometimes only very roughly flaked on one or more surfaces. Often near to the quarry is a work area or “quarry reduction station” where materials are taken for further reduction (Custer 1996:107-108). 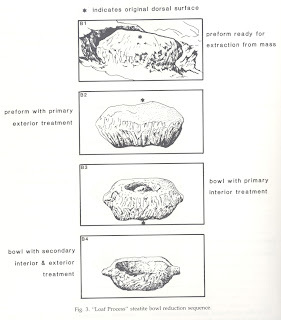 According to Ward and Custer (1988:34-35), however, these secondary reduction sites are absent in steatite bowl production. Instead reduction was begun in the central quarry area in order to verify the quality of the material and reduce the weight for easier transportation before it was taken to the habitation sites where the vessel was then finished. One of the most important aspects of quarry sites is their ability to provide invaluable information on the movement of goods. Comparing stone tools to the material found on any archaeological site to the material available at known quarry sites can identify the artifact’s origin. This can have important implication on our understanding of the movement of people and networks of exchange. Metarhyolite from the Catoctin Formation on South Mountain in the Blue Ridge Province of Pennsylvania and Maryland, for example, was widely used throughout the Piedmont and Great Valley regions of the Middle Atlantic. During the Middle Archaic this source accounts for over half of the diagnostic points in those regions (Stewart 1987). This highlights the high mobility lifestyles of these people and helps us to understand their migratory routes. Using various techniques of geochemical analysis (including X-ray florescence spectrometry, electron microprobe analysis, instrumental neutron activation analysis, and inductively coupled plasma emission spectroscopy, among others) the elemental composition of lithic materials can be determined. While the major elements of a material are essentially the same no matter where it is found, elements present in very small amounts (called trace elements) are often unique to materials of a certain location. The elemental composition of stone tools found on any archaeological site can be compared with that of material from known quarry sites in order to determine their origins. This technology has still not been widely used in Pennsylvania, but it is starting to play a very prominent role in our understanding of the utilization of specific materials and aforementioned implications of lithic sourcing. It is central to the substantiation of archaeologists’ models of migration patterns and social networks of trade and exchange. As it is applied more and more in the future geochemical analysis will greatly increase the information quarry sites provide on the prehistory of Pennsylvania. The Wasicki Cache, found in Indiana County, provides an interesting example of current research using geochemical analysis. Much of this collection consists of early stage metarhyolite “quarry blanks and preforms” (Burkett and Kaufman 2001:2). All artifacts are of the previously mentioned metarhyolite from the Catoctin Formation, roughly 100 miles away. Geologist Dr. Robert Smith used a combination of visual observations and various geochemical analyses on one of the Wasicki Cache artifacts and was able to pinpoint the specific quarry from which the artifact originated. The technique of inductively coupled plasma mass spectrometry (ICP-MS) proved the most useful method for identification, leading to the discovery of the traces of Titania (TiO2) in both the source material and the tool. Dr. Smith is currently analyzing several other metarhyolite artifacts in the same manner. 2001. The Wasicki Cache. Pennsylvania Archaeologist 71(2):1-15. 1996. Prehistoric Cultures of Eastern Pennsylvania. Pennsylvania Historical and Museum Commission, Anthropological Series Number 7, Harrisburg. 1985. Procurement, Tool Production, and Sourcing Research at the Vera Cruz Jasper Quarry in Pennsylvania. Journal of Field Archaeology 12:219-230. 1987. Rhyolite Quarry and Quarry-Related Sites in Maryland and Pennsylvania. Archaeology of Eastern North America 15:47-57. 1988. Steatite Quarries of Northeastern Maryland and Southeastern Pennsylvania: An Analysis of Quarry Technology. Pennsylvania Archaeologist. 58(2):33-49. 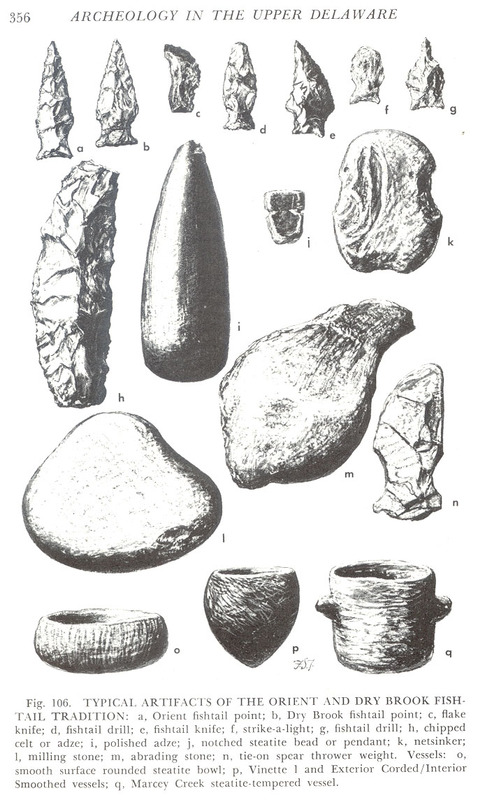 The letter “P” is for pestles, pipes, Pleistocene, pollen analysis, pottery, prehistory, projectile points and this week’s blog will summarize the highlights of the Paleoindian Period in Pennsylvana, the first time period of human settlement in the New World. It dates from 10,000 to at least 16,500 years ago and began with the first people moving into the New World during the Pleistocene or Ice Age. The period ends with changes in the environment and cultural adaptations to a more forested setting. The Period is subdivided into the Pre-Clovis (between 16,500 and 11,200 years ago), and the Paleoindian (between 11,200 and 10,100 years ago). Although there is mounting evidence for people arriving several thousand years prior to Clovis, the Pre-Clovis Period is very controversial and some archaeologists do not believe that humans were here prior to 11,200 years ago. After Pre-Clovis, the Paleoindian Period is divided into Early, Middle, and Late periods, and these sub-periods are based on styles of spear points. The Paleoindians were highly mobile and generally lived in small groups. In the western United States, they were hunting now extinct animals such as mastodon, mammoth (forms of woolly elephants), bison, and horse, but there is little evidence for the hunting of extinct megafauna east of the Mississippi River and none in the northeastern United States. There are several very significant archaeological sites from this period in Pennsylvania, representing some of the oldest, largest, and best-dated Paleoindian sites in the eastern United States. Meadowcroft Rockshelter, the oldest site in the state, dates to at least 16,250 years ago. Because the Pre-Clovis technology was not very distinctive, and human population density was very low, sites from this time period are difficult to identify and are very rare. 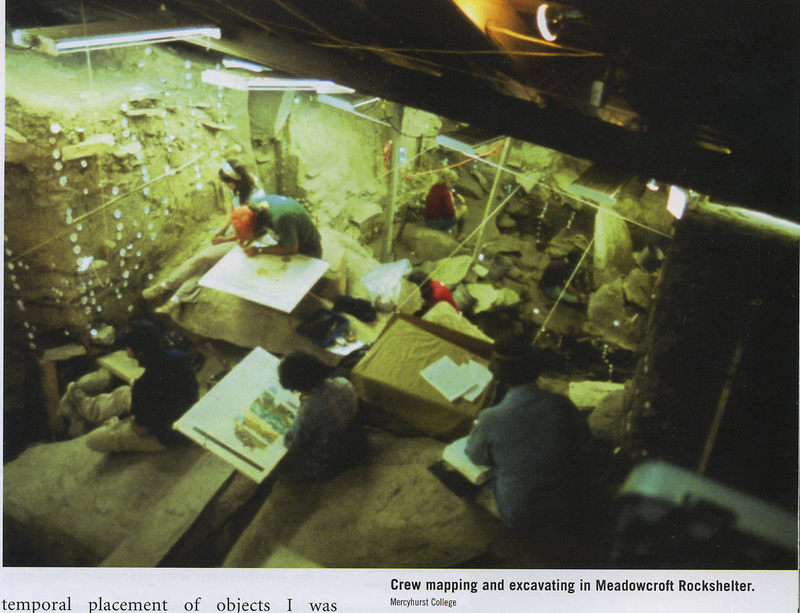 First excavated in the 1970s, Meadowcroft was nearly alone as a Pre-Clovis site in the New World for several decades. However, in the past 15 years, Cactus Hill in Virginia (16,200 BP), Topper in South Carolina (16,000 BP), Debra L. Friedkin in Texas, (15,500 BP.) and Monte Verde in Chile (12,500 BP) have been added to the list of Pre-Clovis sites. Most archaeologists now agree that humans were in North American thousands of years prior to Clovis times. Somewhere in North America around 11,200 years ago, associated with a variety of small distinctive scraping tools and knife-like cutting tools, a new and distinctive spear point was invented. The fluted point, the hallmark tool of the period, is called fluted because of the channel or groove down the length of both sides of the spear point. The groove likely facilitated the hafting of the spear point to the spear shaft. Fluted points are very interesting for a variety of reasons. First, they are unique to the New World. Humans have been making stone spear points for at least 20,000 years, nowhere else are they fluted. Further, they are relatively difficult to make, and approximately 10% were broken in production. Why would these early visitors to the New World choose such a difficult and unique spear point form? Maybe just for that reason: it was unique and a distinguishing symbol of this culture. The earliest fluted point style is called Clovis after a town in New Mexico where these were first discovered associated with mammoth bones. 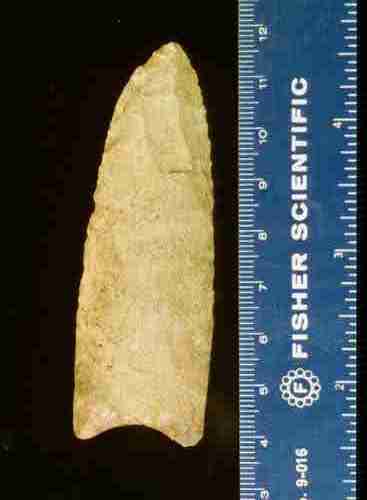 Clovis seems to be the most widespread style of fluted point extending throughout the West, the Southeast and as far north as the Shawnee Minisink site in Pennsylvania. A recent review of radiocarbon dates places it rather precisely between 11,100 BP. and 10,800 BP(uncorrected). 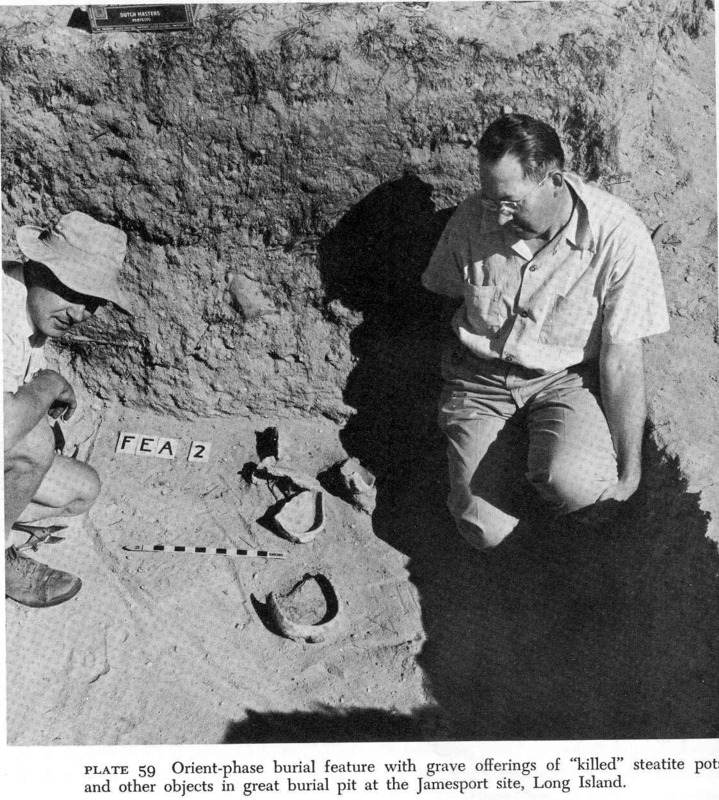 Artifacts from one of the largest Paleoindian sites in the Eastern United States, the Shoop site (in upper Dauphin County), were first analyzed by John Witthoft in 1952, then Pennsylvania’s state archaeologist. Over one thousand tools, including hundreds of scrapers and approximately ninety fluted spear points were made from a stone called Onondaga chert, quarried 250 miles to the north in western New York. The site is approximately 40 acres in size with at least eleven concentrations of artifacts. Each concentration may represent a separate visit by Paleoindians between western New York and central Pennsylvania. Some archaeologists have speculated that this site was probably situated on a caribou or elk migration route, visited on an annual basis to hunt these animals. One of the few known deeply buried Paleoindian sites in the East, Shawnee-Minisink in Monroe County is also one of the best dated Paleoindian sites in the Eastern United States. It contains many tools, including over one hundred scrapers but only two fluted points. Radiocarbon dates from hearths date these tools to 10,950 years ago, a relatively early date for fluted spear points in the Northeast. The two fluted points appear to fit the Clovis style and the dates certainly place the site within the Clovis time frame. 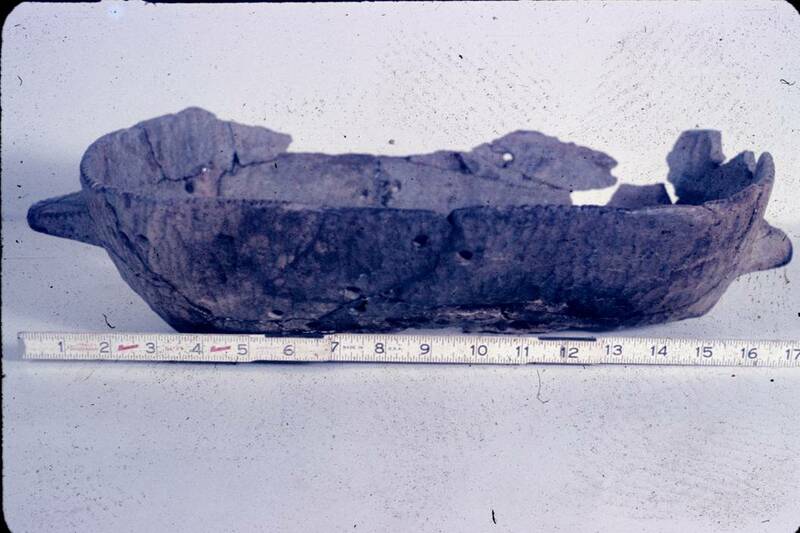 Several cooking hearths have been found containing the bones of fish and a variety of carbonized seeds including hawthorn plum, ground cherry, pokeweed, goosefoot (lambs quarter), hackberry, pigweed, grape, blackberry. It would seem that Shoop and Shawnee-Minisink sites represent different adaptations. Compared to the Shoop site, there is no evidence in the form of large numbers of stone spear points that supports extensive hunting took place at Shawnee-Minisink. Further, 95% of the stone for making tools was a locally quarried chert probably collected within two miles of the site. The remaining toolstone originated less than 100 miles from the source. This suggests a territory much smaller than the Shoop site. This has caused some serious discussion among archaeologists, however, when this issue is examined on a regional basis, these two sites seem to fit a pattern. The Shoop site is similar to sites in New England and the northern Great Lakes. In these regions, there are several sites where charred caribou bone was found, along with a similar ratio of tools to points of toolstone transported up to 300 miles from its source. It appears these sites represent highly mobile hunting groups. In contrast, the Shawnee-Minisink site is similar to sites to the south containing only a few spear points made from locally available toolstone. These southern groups occupied a territory of 75 to 150 miles and exploited a variety of plants and animals. Contrary to the image of Shoop’s big game hunters, Shawnee-Minisink Paleoindians they were essentially hunters and gathers. 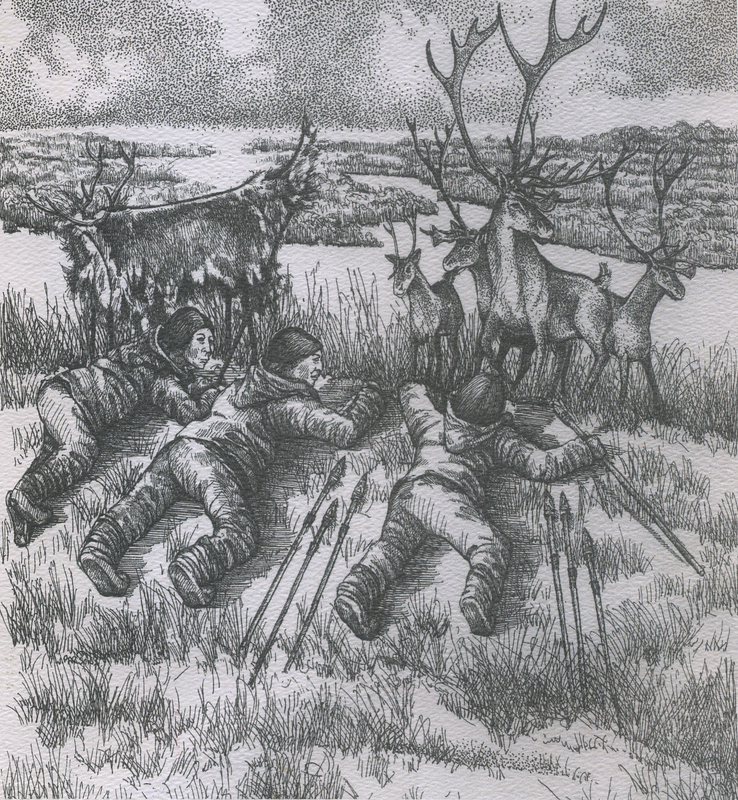 The Paleoindian Period ends with the emergence of a climatic warming trend and a change in the forest type, requiring humans to develop new strategies for acquiring food. New types of artifacts develop as a result, and are identified by Archaeologists as being part of the Archaic Period (10,100 to 4100 before present)). This does not mean that new people replaced Paleoindians. Logically, in the Middle Atlantic region, at least during the Early Archaic period, the Paleoindians were the genetic ancestors of these people. The Paleoindian Period presents a fascinating opportunity for the anthropological study of very low-density populations over thousands of years, documenting how people occupied a new land and their development of enduring cultural traditions. We are beginning to understand Paleoindian technology and diet, but we have much to learn about their social and cosmological beliefs. This week we will return to our alphabetical organization of archaeological topics. “O” is for Old Copper Culture, Olduvai Gorge, Onondaga chert, Owasco, Ozette site and this week’s blog will highlight the Orient Phase. 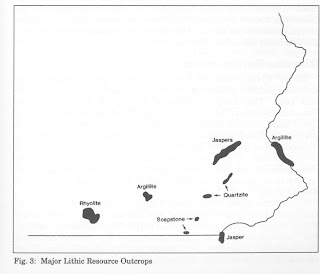 This phase dates between 2700 and 3200 years ago and is characterized by fishtail type points, large fire cracked rock features and steatite bowls. Trade and exchange in lithics such as metarhyolite, jasper and argillite and very early forms of pottery also appear in Pennsylvania. This artifact assemblage is found in Connecticut, New Jersey, Delaware, eastern New York, Pennsylvania and Maryland. The largest sites are frequently found along major rivers. Some of the most important sites in Pennsylvania are Faucett and Zimmermann in the Upper Delaware Valley, Sandts Eddy near Easton, Gerty’s Notch along the middle Susquehanna River and Bare Island in the lower Susquehanna Valley. The Orient Phase was defined by William A. Ritchie (1965:164-178) based on a group of sites on Long Island, New York. These consisted of both habitation and at least four significant cemetery sites. Several of the sites were stratified and exhibited good faunal preservation. The habitation sites, such as the Stony Brook site, demonstrate a change in diet from the deeper Late Archaic occupations. The faunal remains of the earlier occupations were dominated by deer and turkey but the Orient occupations were dominated by shellfish such as oyster, bay scallop, and hard-shelled clam. William Ritchie sitting next to a Orient Phase burial with grave offerings of steatite post at the Jamesport site, Long Island. The diagnostic projectile point type was the Orient point. As defined by Ritchie (1961:39) this type can be characterized as a “slender, gracefully formed point, of medium size, with a characteristic narrow, lanceolate blade merging into a flaring "fishtail" stem. The artifact assemblage also included ovate knives, fishtail base drills, spear thrower weights, fully grooved axes, celts, adzes and rarely cord-marked, grit tempered pottery. Four cemeteries were excavated on Long Island, notably Orient No.1 and 2. These contained both single and communal cremation burials. At Orient No. 2, the burial pit was 20-30 feet across and five feet deep. The majority of the cremations were associated with caches of artifacts that included a fire-making kit, a number of projectile points, one or more stone bowls, a hammerstone and sometimes an adze or a celt. The stone bowls had lugs at each end and showed considerable variation in shape including oval, rectangular, and nearly circular. They were usually from five to eighteen inches long, and two to six inches deep. They frequently were smoke stained and grease-incrusted indicating that they had been used. The steatite bowls in the cemeteries were intentionally broken or “killed”, usually by knocking out a hole in the bottom. In Pennsylvania, W. Fred Kinsey (1972:355-361) has provided the most detailed definition of this time period which he defines as the Fishtail Tradition. This includes many of the artifacts of the Orient Phase but Kinsey defines a second fishtail type, the Drybrook point. There are a very large number of sites along the Delaware and Susquehanna rivers where steatite bowl fragments and large fire-cracked rock features are very common, along with evidence of trade and exchange of lithics. This time period seems to represent a continuation of traditions that developed during the Late Archaic also known as the Transitional period. In some ways the Orient Phase and the Fishtail tradition represent a terminological conundrum. It is frequently noted that fishtail points seemed to have evolved from broadspear types, and they are frequently indistinguishable from re-sharpened Susquehanna broadspears. This would place them with Archaic cultures. However, this phase is also associated with early fired clay pottery. Since pottery is a diagnostic artifact of the Woodland period, this would place this phase in the Woodland Period. This is the problem with defining broad time periods (i.e. PaleoIndian, Archaic, Woodland) by specific artifact types. Obviously, the people of the Archaic period did not suddenly adopt Woodland artifacts into their toolkits. This was a gradual process and archaeologists have recognized that these chronological terms are heuristic devices but we have yet to agree to alternative terminology. 1972 Archaeology in the Upper Delaware Valley. Pennsylvania Historical and Museum Commission, Anthropological Series No. 2. Harrisburg. 1961 A Typology and Nomenclature for New York Projectile Points. New York State Museum and science Service, Bulletin Number 384. Albany, New York. 1969 Archaeology of New York State. Revised Edition, Natural History Press, Garden City, New York. This week we are skipping the letter “O” in honor of our national holiday, Independence Day. Most of us refer to this holiday as merely the 4th of July or the July 4th holiday, advertisements rarely if ever include the words “Independence Day”. Our focus is on picnics and fireworks with little thought given to the sacrifices and events which occurred for us to enjoy our freedoms. Pennsylvania played a pivotal role in the events that led to the creation of the Declaration of Independence and continued to play a major role as the fight for independence evolved. Pennsylvania was established by William Penn as a safe haven for Quakers fleeing religious oppression in England. The influx of Quakers and other passive religious groups to the colony attributed to the delay in Pennsylvania joining other colonies in revolting against the British Crown. Skirmishes in nearby colonies eventually forced Pennsylvanians to join in the revolution. This premise of religious freedom was a factor in the establishment of Ephrata Cloister in Lancaster County. The Cloister was a religious commune settled in 1732 under the leadership of Conrad Beissel. This celibate community led a very simple lifestyle, sheltered from much of the turmoil surrounding them. But even the quiet community of the Cloister could not avoid the changes that occurred with the Revolutionary War during the winter of 1777-1778. The Continental Army was quartered at Valley Forge under George Washington’s command with few provisions during harsh winter conditions. Disease rapidly spread thru the camp and included Typhus, typhoid, dysentery, and pneumonia. The sickened soldiers were sent from the camp to hospitals established in the surrounding countryside, Ephrata Cloister functioned as one of these hospitals. 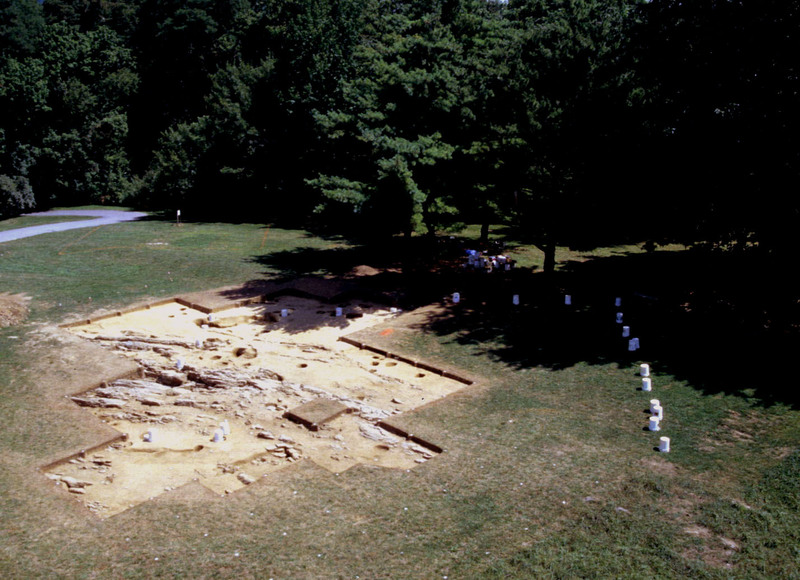 Archaeology conducted at the Cloister by former Senior Curator Steve Warfel of the State Museum of Pennsylvania in 2002 & 2003 verified the historic accounts of a Revolutionary War hospital on the grounds. Excavations in search of the foundation of a 1739 Prayer-house on Zion’s Hill, yielded evidence of the occupation of this site by soldiers of the Continental Army. According to historic records, the Prayer-house was destroyed after its conversion into a hospital during the war. 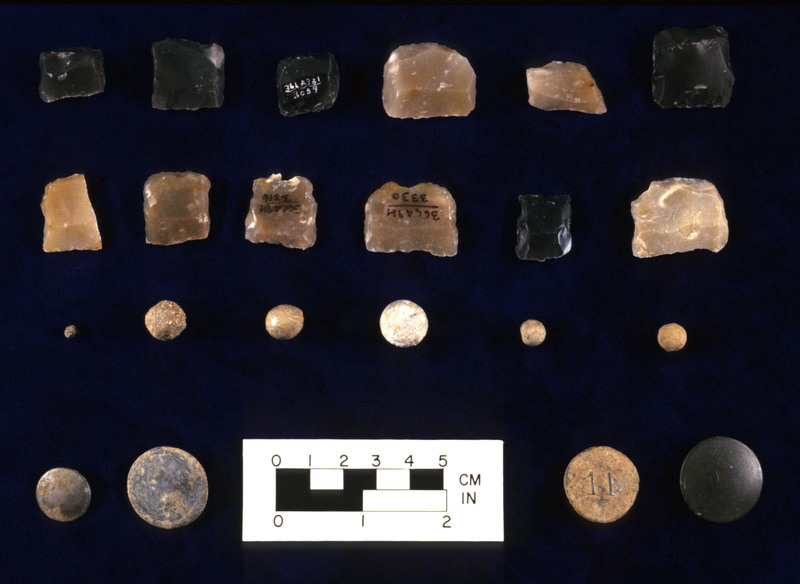 Warfel described the military buttons recovered in his report of excavations Historical Archaeology at Ephrata Cloister; A Report on 2002 & 2003 Investigations. He identified a pewter button as particularly noteworthy, “for it is a regimental button of the Revolutionary War period. Marked “PSR,” the button was made for garments worn by members of the Pennsylvania State Regiment of Foot, an infantry unit (Bower 2000:2). The unit was activated on March 1, 1777 and “officially uniformed in a blue regimental coat with red lining and facing and pewter buttons inscribed PSR”(Gorecki 2003:1). Members of the infantry unit fought at the Battles of Brandywine and Germantown in the fall of 1777. The button implies that one or more members of the regiment were treated at the Continental Army hospital established on Mount Zion “. The third pewter regimental button is marked with the numeral “4” and was recovered from the plow zone soil on the 1738 Brothers' dormitory site during a previous field season. The Fourth Continental Light Dragoons was a mounted unit, raised in January 1777 (Waldo 2003:2). “Most of the men hailed from Pennsylvania, New Jersey, and Maryland” (Waldo 2003:2). Like the Pennsylvania State Regiment and the Eleventh Pennsylvania Regiment, this unit also participated in the Battles of Brandywine and Germantown (Waldo 2003:3-4). These Revolutionary War period regimental buttons are considered rare finds and document the Continental Army’s presence on Zion Hill. 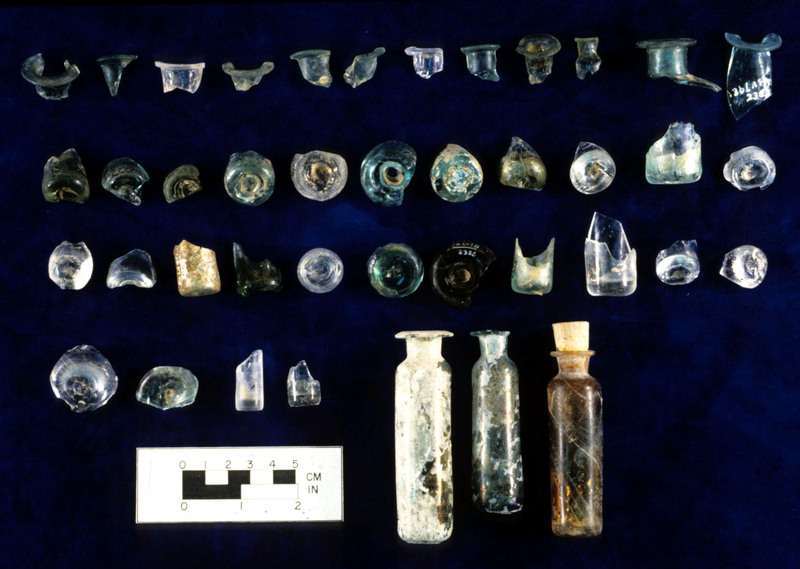 Lead musket balls and shot, English and French gunflints, gun lock parts, a bayonet, hundreds of free-blown glass medicine bottle pieces, regimental and plain buttons, and numerous strike-a-lite flints are byproducts of the Continental Army’s occupation on Zion’s Hill (Warfel 2003). This iron brazier recovered from the excavations on Zion’s Hill likely served as a small camp stove for soldiers of the Continental Army. This is a unique artifact and the only example in our collections. Recent conservation treatment will help insure its preservation for future researchers. The freedoms we enjoy today are the results of years of struggle in formation of a new government, a military force and a financial system. The signing on the Declaration of Independence in Philadelphia was only one step towards building a new nation, years of conflict and sacrifice followed this momentous event. Pennsylvania is known as the “birthplace of liberty”, let us recognize and celebrate this on Independence Day 2011!